NORWALK – Cerritos College announced that its Cerritos Complete Program would be expanding, now offering local students in participating school districts free tuition for two years. 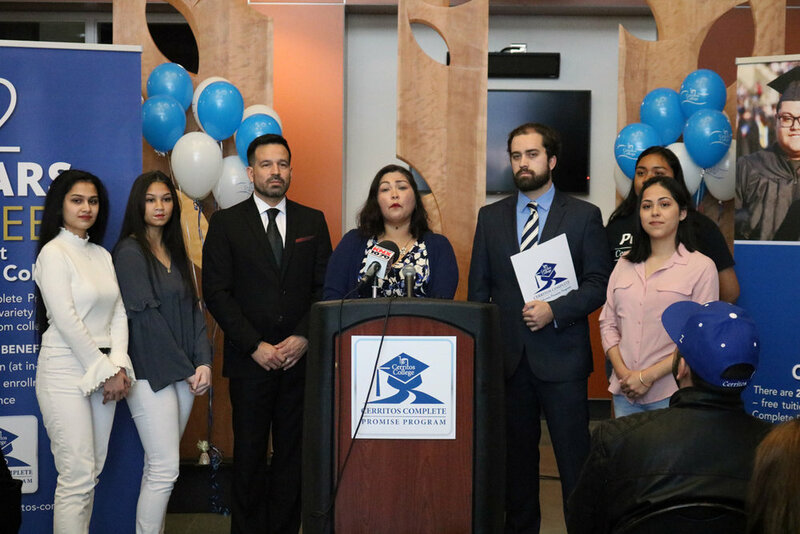 “It’s definitely going to change the way we bring students into Cerritos College and hopefully will continue to impact the success of all of our students as we move through the different stages of the program,” said Cerritos College President and Superintendent Jose Fierro during a press conference on Tuesday. With the program, students will receive two years free tuition, two years of priority enrollment, step-by-step assistance, one-on-one counseling and advisement, college preparedness, career exploration, and personalized schedules for fall and spring semesters. “We believe that adding another year of free tuition is going to give even more students a broader opportunity, and more people in our community a better chance to be successful not just in education, but in life,” said Board of Trustee President Carmen Avalos. Before Tuesday’s announcement, Cerritos Complete had already benefited over 2,500 students. The Cerritos Complete program was originally established in fall 2015, originally offering a single year of free tuition. Since then the program has grown, with Cerritos Complete students representing 25 percent of the entire college’s first-time students. It will now be funded through AB 19 after previously being funded through local dollars. Participating districts currently include ABC, Downey, Lynwood, Norwalk-La Mirada, and Paramount, Field of Dreams Charter School, and adult schools in ABC, Bellflower, Downey, Norwalk La-Mirada, and Cerritos College. Information on the program can be found at www.cerritos.edu/cerritos-complete.